Here I AM beloved one, good evening. It is I, Monjoronson, come forth once more. Now, let us begin with an overview on current events. Your dear Darkies have themselves been rent asunder as we speak. Those who remain are something of a disheveled show of what was once the central stronghold of power, which has all but crumbled. It is a mere shadow of its former self as a body of people. They are quite clear now on who it is that has the upperhand. Yet still they resist, still they fight. But the fight has become one which has been turned inwards now also. And these ones are in states of deep distress and great discomfort. And so it is this that they have wished for. Of course, for them the action has barely begun. And soon they will be centre stage in a rather unexpected and undesired manner. And for you, my ones of great strength, courage, fortitude and enviable devotion: your primed roles await you, too. Make no mistake – you will have your day. Many of you are to become leaders on the global stage. And you will see the benefit then of having had this extra time to prepare yourselves. For all is not what it seems and never was. I will change tack with you slightly to tell of great and wondrous events that are to occur in your night skies. (SK: Had a visual of actual fireworks –may have been a personal projection,tho) Look to the east at the right time for further revelations. 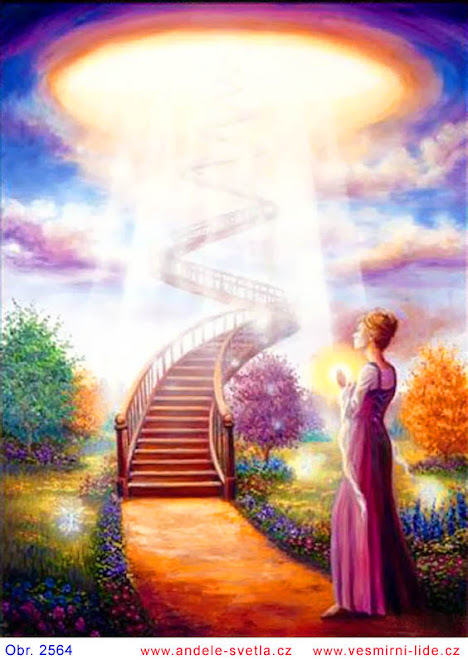 You will see the ‘doves of peace’ and know within what is occurring and why. M: Oh, for good reason. You’ll be able to work it out. During your next days (SK: Don’t necessarily take ‘next days’ to mean actual days of our time)you will begin to see something quite remarkable at work. This will occur in all areas of your world’s expression. It is something which will be of great benefit to you all and that will unfold at just the right pace to provide you with the leverage you will be needing. Which will then be able to springboard you into your places and positions in readiness of all that is to come. We have prepared a most elaborate surprise for you all. By that I mean a surprise on your earth. And one which unmistakably informs people that they have been terribly duped – happily or not. Think of what occurs then as a rescue operation, with you being the rescuers as one would have them when a boat capsizes and people fall into the water without safety jackets on. Think of yourselves as the rescue crew (SK: visual of people flailing about on the surface of a river and not being able to swim or keep afloat). Some of course, will resist attempts at being rescued and will try to go against the current. You will do only what you can do and no more. We are holding you so very close to us, dear Hearts. Feel our love and how we wish to support you. We know it has been a tough road and for many of you it feels as if it’s gotten a lot tougher recently. We want nothing but Joy and Ease for you, our most beloved brethren. And it is but a short passage now to the ‘official’ end. So hold to your Truth within and find an anchor within and with us. We will provide you with the strength you need. Indeed, that will do for tonight. Israel better watch out! Based on sheer numbers, China's about to show them up in the highly-profitable international human organ harvesting industry. Although Israel can still presumably teach China a bit on manipulation, kidnapping, victim torture and other delightful Mossad-style tricks of the trade to get the required organ/s on order. Based on their history in the industry. But for numbers and system-efficiency...I'm betting my buckeroos on China. Just read the description of the execution vans. How on earth can we possibly believe that if 10 000 Chinese prisoners/potential forced organ donors were expected to be executed in 2009, that that figure could drop in 2013? Especially when all parties involved have experienced just how lucrative it is! There are less than 300 voluntary donors of kidneys annually in China. But China does between 10-20 000 organ transplants annually. You do the maths as to just how reliant the system must be on producing enough 'criminal executions' annually to have supply meet demand! That's just a figure, thumb-sucked to probably shut up so-called human rights groups like Amnesty, etc. And I'd seriously bet that unofficially the figure of forced organ donor 'executions' is today likely many times 10 000 annually. Particularly if just one province has 18 vans alone! After all, the population is the world's largest at 1,4 billion people. And the alleged collusion of the country's police, judiciary and doctors have their hands on a magnificent get-rich-quick scheme in human body parts. Some of my own shanty-dwelling neighbours recently told me how organ harvesting's come to our own city in a bigger way. Even less officially, I mean. As there have been numerous (and increasing) legal claims out against both medical groups here and individual doctors during the past few years - for a range of malpractises. Unoffically, organ harvesting scouts set to work by such rings here are hunting down 'sellers' of eyes, kidneys and livers. They currently seem to be the top organs demand! But, hey, if you can't find what your boss is looking for, when he's looking for it, you can always resort to open murder here. A whole gamut of murders where specific body parts are consistently found removed are never put out through our MSM. And when they are, they're usually put down to 'muti'(pronounced 'mootie') murders. Implying that local sangomas (witchdoctors/African healers) are linked to these. In some cases, they have been in the past. But ignoring or putting such murders down to muti crimes is pretty perfect police cover. 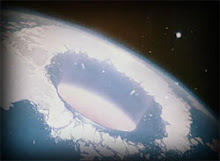 It's all getting very grotesque, very quickly, down here on earth. How much more depraved can human(un)kind get? Responding to criticism that China cruelly and arbitrarily executes a large number of its citizens each year, officials are gradually moving toward what they say is a more discreet way of killing its prisoners: execution vans. Human-rights critics say they may look more like officially sanctioned roaming death squads, which allow China to execute prisoners quickly, easily and out of the public eye. Chinese legal officials counter that the fleet of execution vehicles is a "more humane" form of carrying out death sentences. One thing for sure: they are a radical departure from publicly held execution rallies organized in the past. China has traditionally always taken a ruthless, unemotional view of crime and punishment. Before injections and bullets, the most chilling sentence was death by Ling Chi - death by a thousand cuts - which was abolished only in 1905. The condemned man was strapped to a table and then, in what was also known as 'slow slicing', his eyes were gouged out. This was designed to heighten the terror of not being able to see what part of his body would suffer next. Using a sharp knife, the executioner sliced at the condemned's body - chopping off the ears, fingers, nose and toes, before starting to cut off whole limbs. As opposed to the shootings that took place in public, inmates are now executed in purpose-built vans in an almost clinical environment. Prisoners are confined to a bed, similar to an ambulance stretcher, and put to death with lethal injections. The contents of the drug cocktails used for the lethal injections are mixed in Beijing and delivered to local intermediate courts where the trials take place. China developed its fleet of mobile execution chambers slowly, after cautiously experimenting with lethal injections for the first time in selected provinces beginning in 1997. It has now adopted them on a larger scale in more localities. The exact number of vans being used is a state secret. What is known, however, is that Yunnan province alone has 18 mobile units in use. "I think it is definitely progress for China, and it shows more consideration both for the people sentenced to death and for others" (their relatives and the public), said Li Guifang, vice chairman of the Criminal Affairs Committee of the All-China Lawyers Association. "There is less pain for the convicted." But human rights rights groups point out that evidence from the United States shows lethal injection, too, inflicts pain. They also claim China executes more criminals every year than the rest of the world combined. The exact number, again, remains a highly confidential state secret. Amnesty International recorded at least 1,770 death sentences carried out in China in 2005, but it says the real number could be as high as 8,000. The move from firing squad to lethal injection "demonstrates tremendous progress in China's criminal-judgment proceedings", Yin Yong, director of Zhejiang province's Supreme Court, told the state media last month. First tried out in 1997 in Yunnan province - a southwestern region bordering the Golden Triangle and notorious for its drug trafficking - death vans are now used in booming industrialized places where crime rates have soared, such as the coastal province of Zhejiang. The mobile death fleet is being touted by Chinese legal officials as the latest advance in China's judicial system as Beijing tries to revamp its international image. The vans are now in vogue because they allow for death sentences to be carried out without the usual trip to the execution grounds and they are cheaper - each execution van is priced at about 500,000 yuan (US$60,000) and, of course, can be reused. Lethal injections require only four people to assist in the execution, while the practice of death by firing squad needs numerous guards at the execution site and along the road to the site. The vans also prove that China has abandoned a long-standing practice of public executions. After China signed the United Nations Convention against Torture in 1984, it issued new regulations banning execution rallies. Rights activists claim, however, that the rallies have continued during the various "Strike Hard" anti-crime crackdowns first initiated by the government in 1983 and revived in 1996. But these rallies no long happen in large cities where foreigners live. As mobile execution chambers begin to roll silently into more and more towns, fears arose among activists and death-penalty opponents that China was relying on lethal injection to harvest organs of executed prisoners, in an effort to supply the country's growing market for organ transplants. According to undercover investigations that were undertaken by human rights' groups, the Chinese police, judiciary and doctors are all involved in making millions from a huge trade in human body parts. Inside each 'death van' there is a dedicated team of doctors to 'harvest' the organs of the deceased. The injections leave the body intact and in pristine condition for such lucrative work. After checking that the victim is dead, the medical team first remove the eyes. Then, wearing surgical gowns and masks, they remove the kidney, liver, pancreas and lungs. Little goes to waste, though the heart cannot be used, having been poisoned by the drugs. The organs are dispatched in ice boxes to hospitals in the sprawling cities of Beijing, Shanghai and Guangzhou, which have developed another specialist trade: selling the harvested organs. At clinics all over China, these organs are transplanted into the ailing bodies of the wealthy - and thousands more who come as 'organ tourists' from neighbouring countries such as Japan, South Korea, Singapore and Taiwan. Chinese hospitals started organ transplants in the 1960s and now perform between 10,000 and 20,000 transplants annually, according to official figures. A kidney transplant in China costs about $7,200, but this official price could swell to $20,000 or even $50,000 if the patient is willing to pay more to obtain an organ sooner. Even those prices, though, amount only to a fraction of the price for an organ transplant in developed countries. Laws introduced in 2006 make it an offence to remove the organs of people against their will, and banned those under 18 from selling their organs. But, tellingly, the law does not cover prisoners. Regulations issued in 1984 stipulate that the removal of organs from executed prisoners should be "kept strictly secret, and attention must be paid to avoiding negative repercussions". 'Organs can be extracted in a speedier and more effective way using these vans than if the prisoner is shot,' says Amnesty International. 'We have gathered strong evidence suggesting the involvement of Chinese police, courts and hospitals in the organ trade.' The bodies cannot be examined. Corpses are driven to a crematorium and burned before independent witnesses can view them. "The use of mobile execution chambers exacerbates existing problems with prison-related issues in China," Sharon Hom, executive director of Human Rights in China, wrote in an e-mail interview. "It facilitates the black-market trade in organ sales particularly because there is no access for independent monitors, such as the Red Cross, to prisons, detention centers and labor camps." While other countries worry about the morality of the death penalty, China has no such qualms. For the Beijing regime, it is not a question of whether they should execute offenders, but how to do it most efficiently - and make the most money from it. And patients from Malaysia, Japan, Hong Kong and Singapore are all flocking to China for transplants. The Nazis used adapted vans as mobile gas chambers from 1940 until the end of World War II. In order to make the best use of time spent transporting criminals and Jewish prisoners, Hitler's scientists developed the vehicles with a hermetically sealed cabin that was filled with carbon monoxide carried by a tube from the exhaust pipes. The vans were first tested on child patients in a Polish psychiatric hospital in 1940. The Nazis then developed bigger models to carry up to 50 prisoners. They looked like furniture removal vans. Those to be killed were ordered to hand over their valuables, then stripped and locked inside. As gas was pumped into the container and the van headed towards graves being dug by other prisoners, the muffled cries of those inside could be heard, along with banging on the side. With the 'cargo' dead, all that remained was for gold fillings to be hacked from the victims' mouths, before the bodies were tipped into the graves. Now, six decades later, just like the Nazis, China insists these death vans are 'progress'. 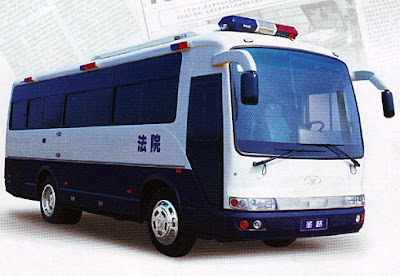 After trials of the mobile execution service were launched quietly three years ago - then hushed up to prevent an international row about the abuse of human rights before the Olympics last summer - these vehicles are now being deployed across China. The number of executions is expected to rise to a staggering 10,000 people this year (not an impossible figure given that at least 68 crimes - including tax evasion and fraud - are punishable by death in China). They cost £60,000, can reach top speeds of 80mph and look like a police vehicle on patrol. Inside, however, the 'death vans' look more like operating theatres. Death is reputed to be quick and painless - not that there is anyone to testify to this. The idea for such a 'modern' scheme is rooted in one of the darkest episodes in human history. With the 'cargo' dead, all that remained was for gold fillings to be hacked from the victims' mouths, before the bodies were tipped into the graves. 'This deters others from committing crime and has more impact,' said one official. Indeed, a spokesman for the makers of the 'death vans' openly touted for trade this week, saying they are the perfect way to 'efficiently and cleanly' dispatch convicts with lethal injections. Reporting steady sales throughout China, a spokesman for Jinguan Auto - which is situated in a green valley an hour's drive from Chongqing in south-western China - said the firm was bucking the economic trend and had sold ten more vans recently. Officials say the vehicles are a 'civilised alternative' to the traditional single shot to the head (used in 60 per cent of Chinese executions), ending the life of the condemned quickly, clinically and safely - proving that China 'promotes human rights now,' says Kang Zhongwen, designer of the 'death van'. It seems a perverse claim, but certainly the shootings can be gruesome. Once carried out in public parks, these executions -sometimes done in groups - have seen countless cases of prisoners failing to die instantly and writhing in agony on the ground before being finished off. There are other concerns: soldiers carrying out the shooting complain that they are splashed with Aids-contaminated blood. After the shooting, relatives are often presented with the bullet hacked from the condemned's body - and forced to pay the price of the ammunition. China has traditionally always taken a ruthless, unemotional view of crime and punishment. Before injections and bullets, the most chilling sentence was death by Ling Chi - death by a thousand cuts - which was abolished only in 1905. The condemned man was strapped to a table and then, in what was also known as 'slow slicing', his eyes were gouged out. This was designed to heighten the terror of not being able to see what part of his body would suffer next. Using a sharp knife, the executioner sliced at the condemned's body - chopping off the ears, fingers, nose and toes, before starting to cut off whole limbs. According to undercover investigations by human rights' groups, the police, judiciary and doctors are all involved in making millions from China's huge trade in human body parts. 'Organs can be extracted in a speedier and more effective way using these vans than if the prisoner is shot,' says Amnesty International. A police official, who operates a 'multi-functional and nationwide, first-class, fixed execution ground' where prisoners are shot, confirmed to the Mail that it is always a race against time to save the organs of the executed - and that mobile death vans are better equipped for the job. 'The liver loses its function only five minutes after the human cardiac arrest,' the officer told our researcher. For the Beijing regime, it is not a question of whether they should execute offenders, but how to do it most efficiently - and make the most money from it. Making choices to stop consuming flesh and becoming a vegetarian is great. But fact remains that you have no clue whether or not you're consuming a fish gene or something else equally hideous when you unsuspectingly eat a juicy, red tomato wedge! Monstrous Monsanto are doing everything in their (monetarily-excessive) power globally to start/continue the human body's decline into as much poor health as is possible with their multitude of poisoned seeds. But not every nation's prepared to take their bully boy tactics lying down...thank the goddess!